Create translation tasks for project contributors and keep track of the progress. Once there is any translation work you need to assign to Contributors, use Tasks function. You may select multiple keys in the editor and then choose Create task... in the blue popup menu. This would open the task creation page with a predefined task scope, limited to the keys you have just selected. You may navigate to project's Tasks page and click Create new task button. Define task scope manually by using project filters. As you start creating new task the filter is preset to Untranslated, however you may customize it the same way as the editor's filter. As you define task scope and select target languages the system automatically adds all possible assignees, language by language. Project admins are not added as assignees by default, however you may adjust Include admins as assignees switch in the upper right corner of the task creation page if you them to be included automatically. As potential assignes are displayed, you may click each language box to review or add/remove assignees prior to creating a task. Once you assign a task to contributors, they receive notification e-mail along with the notification to their Incoming task widget. The translations (items) that are included in the task have a status of completed or uncompleted. This status is changed either once a translation is updated or by clicking the status icon in the editor manually. 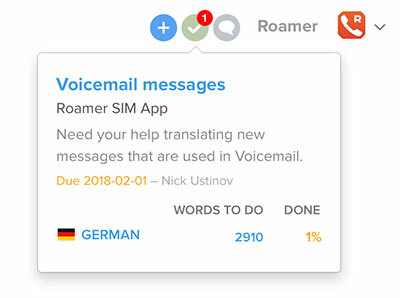 If you have not enabled Auto-close languages switch when creating a task, the contributors have to mark languages as done as they are 100% completed. 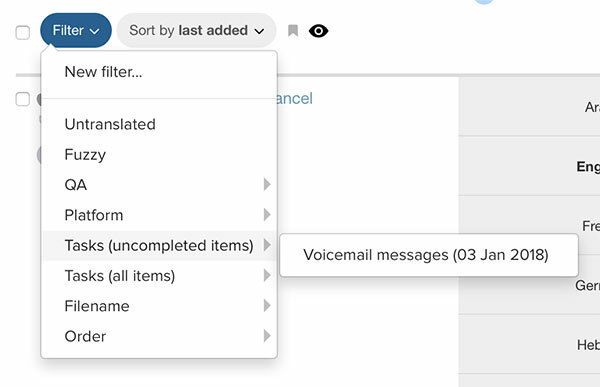 Once a translator marks language as completed (using the Incoming task widget), project admins would receive an e-mail notification. Project admins can force close languages in project's Tasks page. As all languages are closed (marked as completed) project admins may close the task to archive it. We've added two new preset filters in the editor that let you and translators quickly access the required keys in the editor. Uncompleted items filter shows keys to be done in the task (ones with the uncompleted status). All items filter shows all task keys despite their status. Click project's Tasks page to see task progress. Pro tip: If you would like to see task progress in your personal Task widget (assuming you are an admin creating the task) you need to add yourself to the task as an assignee.